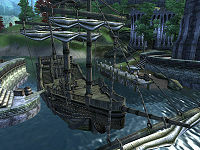 The Marie Elena is a pirate ship docked at the Imperial City Waterfront. Once cleared of pirates, the ship makes an excellent home. All beds and items are unowned (they will not count as stolen when you pick them up), and the pirates are non-respawning. This room can be divided into three areas: the antechamber, the bedroom, and the dining room. The antechamber holds only a trapdoor that leads to the mid deck. In the southeast corner of the bedroom is a clutter desk with a note and a copy of Fall of the Snow Prince sitting on top. In the southwest corner, a set of clutter drawers holds on top of it the Captain's chest, which holds an emerald, two flawless pearls, and 100 gold. The raised dining area in the north end of this level holds a drinks cupboard in the southwest corner and a table with grapes, two sweetrolls, and a potted nirnroot on top of it. The Captain's chest does not respawn, but every other container here does. 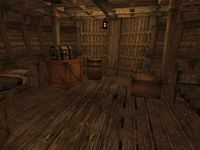 Upon entering from the captain's cabin, the facing shelves hold two grains sacks and a chest with clutter. 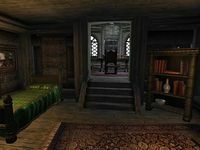 The room to the north holds two single beds, three barrels, three crates, and a sack that all contain clutter as well as another sack that holds grain and a chest that can contain armor and weapons. To the south is a narrow corridor. The first room is a small bedroom with a single bed and a set of drawers with a chest on top; both contain clutter. 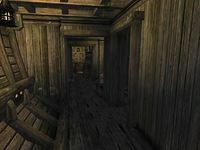 At the end of the corridor, past the empty room, an open doorway on the east wall leads to a room that holds two barrels, a crate, and a sack that all contain clutter as well as two grain sacks. The door on the south wall leads to a bedroom with a table that holds a tomato and a loaf of bread. A repair hammer lies on the floor at the head of the bed. The armor chest and the sacks are the only containers on the mid deck that do not respawn. The first room on the lower deck holds a clutter barrel, three grain sacks and a chest with gold and silverware. The closet adjacent to this room holds two barrels and three sacks that contain clutter along with another grain sack. The second room on the lower deck holds a barrel, a crate, and three sacks, all containing clutter, as well as a final grain sack. The final room on this level holds two barrels and four crates that also contain clutter, and a chest with leveled equipment. The two chests and all the sacks are safe for long-term storage. A Watery Grave: You must kill the captain of the pirate vessel Marie Elena. Esta página foi modificada pela última vez à(s) 13h54min de 8 de junho de 2013.